About four years ago, someone had contacted me to review this six-track EP. Like a complete tool, I complied! If I was a tool back then, what does it say about me that I’m going back and re-listening to it? ... I'm probably insane! When I listened to it back then, I wasn’t impressed with it. I thought it started out well, but then it faltered after the third track. I was new to the genre, however, and so maybe I was just being naive about the whole thing. ...Nope. I should trust my past instincts more! I’m listening to it now, and I think the exact same thing. 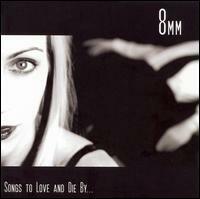 8mm have one style and one style alone: dreariness. If you don’t like this style, then you had might as well pack up your belongings and ship out. You can expect this to be heavy on the atmospheric synthesizers, piddly guitars and spaced-out vocals. ........Oh god, there are too many bands out there like this. No wonder rock is dead! But again, they did it right on the first three tracks. “Opener” is the opener of Opener. It’s a nicely captivating song that starts out with a creepy, descending chord progression played with a simple electric guitar. They don’t change the chord progression at all throughout, but they slowly increase the dynamics of the instrumentation so at least it continues to feel fresh as it plays. “Save Yourself” is almost a real song. I mean, it not only has verses, but something that even resembles a *chorus*. (I have a sneaking suspicion that they actually meant that as a middle-eight section, but let’s just forget about that.) “Never Enough” is an OK song, but the dreariness of it starts to bog down on me. But at least it has a hooky melody, and Juliette’s ultra-sweet coo gives me a warm, fuzzy feeling! Those were nice songs. Unfortunately, the last three tracks are pretty freaking awful. Arguably, “Nothing Left to Lose” is the worst one, but that will depend on how much you like rap music. They bring an outside guy into do it, and he’s just stale at it. I admit that I have a strong bias against rap, and I don’t know much about how to perform it. But I know that you can’t make it very far in the business if you don’t have a personality! I’m sure that even Al Gore is capable of rapping with a stronger personality than this guy. In “Crawl,” Beaven speaks most of the lyrics instead of sings them... I don’t have a problem with that, but the background instrumentation is so nerve-wracking that it’s virtually intolerable. “Give it Up,” the six-minute closer to Opener, simply should not have been six minutes long. Geez... it’s like I have to KILL someone to write a good chord progression now and again! This album definitely has a mood and sense of purpose, but these guys just don't have the willingness to breathe LIFE in most of these songs. This music, while usually nice, is entirely derivative of '00s dream-pop standards. Where's the ambition? Where's the creativity? Hmmm??? The melodies are usually fine and complex, but I sit here listening to it hoping for a glorious hook or two to brighten up the whole experience. They rarely come around. The production is technically perfect, but there's nothing about the instrumentation that grabs me by the ears. Just sooooooooooooooooooo boring. The album is only 40 minutes, but even that seems too long. That's a shame. There's three songs I want to point out. The album opener "No Way Back" is about as good as it gets with this album. The instrumentation was well-done, and I can even detect the slightest hint of life behind all the dreariness. "Quicksand" is notable because of its melody. It's not the greatest melody known to mankind, but it does effectively show us all that a good melody can do for a song! Probably the best song in terms of development is the closing track "Forever and Ever Amen." All the others songs on this album have the unfortunate tendency to never alter its single, dreary mood from beginning to end. This track, however, has dramatic build-up that actually seems to go somewhere and mean something.